Let’s learn history and culture of Aizu! 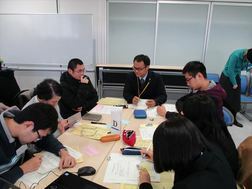 On January 7, 2017, "Aizu Town Campus" was held in Aizu Keikodo in cooperation with UoA and Aizu Keikodo. The purpose of this event is to encourage high school students and UoA students to socialize with the local residents in different generations and countries through learning history and culture of Aizu. In total, 15 UoA students joined this event including international students. 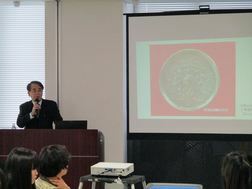 The event started with a lecture about the history and culture of Aizu, and the participants devoted all their attention to the lecture with their curiosity. After the lecture, the question and answer session was taken place that the lecturer and the participants had in a relaxed atmosphere. 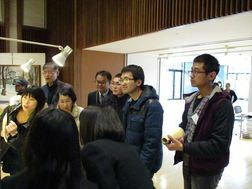 Then the participants moved to an "Historical Transition of Aizu with Old Maps, Photos and Paintings Exhibition", and enjoyed looking at the exhibits related to the history of Aizu. After the viewing, the participants picked up their favorite exhibits and shared ideas about their selections in a group working. According to the reflection of this event, there were many positive opinions and comments: "It was new for me to socialize with the students. In the beginning, I thought I came to the wrong place though, it was so fun in the end. 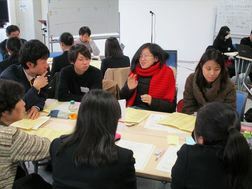 ", "It was surprising that UoA has an seminar in which local residents and students learn together." It seemed that the event was expected to be a new connection between students and local residents. OSIP will proactively plan these activities to promote cross-cultural communication for UoA students.